The International Boxing Hall of Fame weekend was hosted by James “Smitty” Smith in the small town of Canastota outside New York. 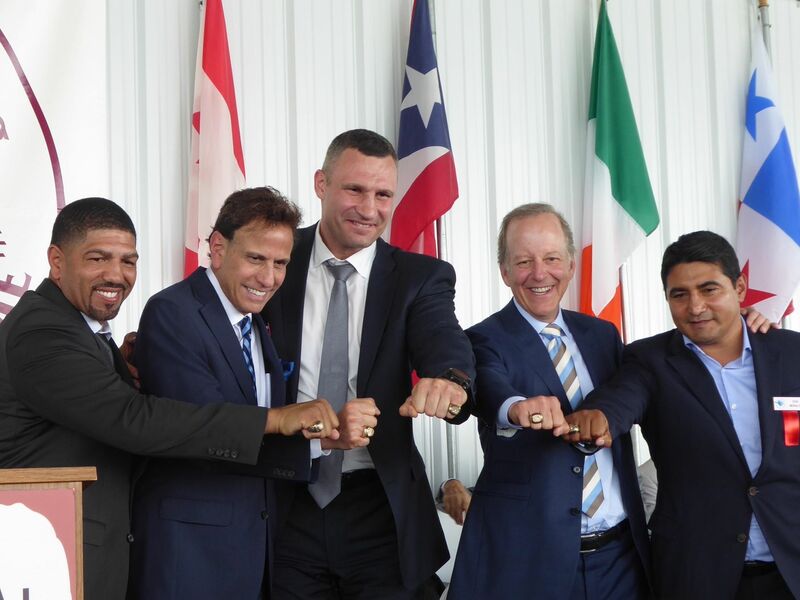 The inauguration into the hallowed halls of fame for this year included boxers Ronald “Winky” Wright, Erik Morales and Vitali Klitchsko alongside promoter Klaus – Peter Kohl and boxing broadcasters Steve Gray & Steve Albert. This is a fantastic weekend for fight fans as it allows them access to some of the biggest names in the sport, both past and present, as they happily had photographs taken and signed autographs. It’s almost impossible to get around everyone and some are more accessible than others. However, every boxer that spoke gave a great insight to their life as a fighter and those that didn’t were still happy to take questions including James Toney, Julian Jackson, Christy Martin, Kelly Pavlick, Micky Ward, Dicky Eklund, Leon & Michael Spinks, Gerry Cooney, Jessie Vargas, Jarret Hurd, Robert Guerrero, Tony Tubbs, Marvin Hagler and Thomas Hearns. Winky Wright and close friend Antonio Tarver were in attendance, Winky opened up on the fact that to get to the top he had to travel at the start of his career and fought 20 times overseas before becoming world champion. Acknowledging what he has done in the sport to merit being inducted which included moving up the weight classes to take on Jermaine Taylor and Bernard Hopkins Winky said “to become great you have to do great things” Not known for having one punch knock out power Winky addressed this issue by stating “I don’t try to knock you out, I try to beat you up so you don’t want to fight me again”. Discussing who his most challenging opponent was, Winky confessed it was Shane Mosley not just because of how good a fighter he was but also as they were the fights that led to him getting the Felix Trinidad fight. Erik Morales and fellow inductee from 2017 Marco Antonio Barrera came on stage together showing that the once fierce rivalry has moved to friendship as they praised each other. Barrera admitted that they had actually sparred as amateurs (although only once) and even at that stage he knew he would go on to fight Morales on a bigger stage. He also went on to say he respected Morales for his power and that he hit the hardest out of all his opponents. In turn Morales felt that Barrera was an intelligent boxer who also had a mean streak, he also joked that in the 3rd fight of their trilogy he chose winning gloves as he thought Barrera was colour blind and wouldn’t see the punches coming! Miguel Cotto discussed how he got into boxing to lose weight before going to the Sydney Olympics in 2000. He would not however be drawn on the now infamous Antonio Margarito fights and firmly stated that he could not tell if there was anything inside the gloves or otherwise and that to him it was just another fight. He also claimed that in the 2nd fight he did not go out to prove anything to Margarito or teach him a lesson, he did admit that it was his most personal fight and he wanted to show the rest of the world he was the better fighter. Cotto was also quick to praise trainer Freddy Roach and said that regardless of how Freddy was feeling, as he is known to have good days and bad days with his condition, he gave his absolute best which pushed you on to do the same. Vitali Klitchsko, whose brother Wladimir was also with him, mentioned that as a skinny 15-year-old kid he was watching Mike Tyson win the world title and told his friends he was going to become a boxer and be the world champion. He was laughed at but 18 years later he remembered who had laughed and went back to them with the WBC world heavyweight championship belt. While speaking with John H Stracey, he told me that out of the current crop of UK fighters he liked Tyson Fury and thought he would go on to claim back his heavyweight title and also Josh Taylor who he felt could go all the way. I also witnessed all sides of Iron Mike Tyson as in speaking to him he could not have been nicer and certainly seemed to be like a man who had chased away his demons of which much of the credit must surely go to his lovely wife Kiki. He also became emotional and wept in front of the crowd when making a speech about Steve Gray as he presented him with his Hall of Fame ring, however it wouldn’t be Tyson without some sort of controversy and that duly came after Don King gave his own speech on Saturday night at the banquet of champions dinner. As he walked back to his seat he patted Tyson on the shoulder, Tyson looked round and proving that he is still clearly holding some animosity towards King, picked up a glass of water and threw it over him, he later admitted the red mist came down and that it was immature of him to do this. Overall a common theme that was mentioned by many boxer’s present was the belief that too many fighters are not committing to the big fights and shying away from fighting one another to prove who was the best. The Bronze Bomber Deontay Wilder must have been listening to this as he mentioned later that he would be signing the contract to take on Anthony Joshua which is a fight that will be welcomed by many. As the weekend drew to a close I couldn’t help thinking who would be inducted into next year’s Hall of Fame. The rules state that a boxer must be retired for 5 years before they can be considered for this honour. Don’t be surprised to see the name of Ricky “The Hitman” Hatton be called up as he now becomes eligible for the class of 2019 and would be a popular choice with both the panel and fans alike.